우즈베키스탄 제품 인증(Uz Standard Certificate) 관련 법규는 다음과 같습니다. 3. Interdepartmental customs tariff board composed according to the appendix number 2 * . * Appendix number 2 is omitted. analyzing and making proposals on amending and supplementing the existing system of customs and tariff privileges and preferences. 4. Establish that a March 1, 2001 customs clearance mode “release for free circulation (import)” products, according to the application number 3 , contracts whose total value exceeds 10 million U.S. dollars, shall be subject to the mandatory implementation of pre-shipment inspection. Import contracts signed and put on record the authorized bodies of the Republic of Uzbekistan to March 1, 2001, and which has already made delivery of goods and / or payments are executed in accordance with previously established procedures. 5. Amend the decision of the Cabinet of Ministers in accordance with the application number 4. 7. Ministries and agencies together with the Ministry of Justice within one month lead departmental regulations in line with this decision. 8. The enforcement of this decision to assign to the Prime Minister of the Republic of Uzbekistan UT Sultanov. * Vvozimye for projects included in the investment program of the Republic of Uzbekistan. 2. Of the first subparagraph of paragraph 6 of the Cabinet of Ministers of the Republic of Uzbekistan on March 31, 1998 № 137 “On additional measures to liberalize foreign trade in the Republic of Uzbekistan” word “and imported” deleted. 3. Образовать Межведомственный таможенно-тарифный совет в составе согласно приложению № 2*. проведение анализа и внесение предложений по изменению и дополнению действующей системы таможенно-тарифных льгот и преференций. 4. Установить, что с 1 марта 2001 года таможенное оформление в режиме «выпуск для свободного обращения (импорт)» товаров, согласно приложению № 3, по контрактам, общая стоимость которых превышает 10 тысяч долларов США, производится при условии обязательного осуществления предотгрузочной инспекции. Импортные контракты, заключенные и поставленные на учет в уполномоченных органах Республики Узбекистан до 1 марта 2001 года, и по которым уже осуществляются завоз товаров и/или платежи, исполняются в соответствии с ранее установленным порядком. 5. Внести изменения в решения Кабинета Министров согласно приложению № 4.
абзац второй пункта 1 постановления Кабинета Министров Республики Узбекистан от 7 августа 1999 г. № 380 «О вопросах улучшения деятельности автозаправочных станций и обеспечения автобензином». 7. Министерствам и ведомствам совместно с Министерством юстиции Республики Узбекистан в месячный срок привести ведомственные нормативные документы в соответствие с настоящим постановлением. 8. Контроль за исполнением настоящего постановления возложить на Премьер-министра Республики Узбекистан У.Т. Султанова. *Вьвозимые для реализации проектов, включенных в Инвестиционную программу Республики Узбекистан. в абзаце втором пункта 4 приложения № 1 слова «50 тыс. долларов США» заменить словами «10 тыс. долларов США». 2. Из абзаца первого пункта 6 постановления Кабинета Министров Республики Узбекистан от 31 марта 1998 г. № 137 «О дополнительных мерах по либерализации внешнеторговой деятельности в Республике Узбекистан» слово «и ввозимым» исключить. 3. Абзац второй пункта 2 постановления Кабинета Министров Республики Узбекистан от 4 августа 1998 г. № 331 «О дополнительных мерах по усилению государственного контроля за ввозом, производством и реализацией алкогольной и табачной продукции» дополнить словами «если общая стоимость контракта превышает 10 тысяч долларов США». “Laboratory Accreditation” - official recognition of competences testing laboratory (center) to test a specific product or a particular type of test. Confirmation of quality products, declared by the manufacturer (seller, performer). Certification is mandatory and voluntary. Relations in the field of certification are regulated by this Act and rules issued thereunder other legislative acts of the Republic of Uzbekistan and the Republic of Karakalpakstan – legislation of the Republic of Karakalpakstan. If an international treaty or agreement establishes rules other than those provided for by the legislation of the certification, the rules of international treaty or agreement. Costs associated with the accreditation of testing laboratories (centers) and certification bodies, borne by the applicant. Testing laboratories (centers) accredited certification system established by the corresponding procedure fulfill the test of specific products or specific types of tests, and provide protocols for certification purposes. Certification objects are products (including software and other scientific and technical products), services, and quality system. Upon confirmation of the Product Conformity certification authority issued the certificate of conformity, based on which manufacturer has the right to use the mark of conformity. Certificates of conformity, marks of conformity, certificate of accreditation of certification bodies and testing laboratories (centers) have not been registered in the State Register, are invalid. Transfer of the applicant’s right to use the certificate of conformity, a mark of conformity and certificate of accreditation of certification bodies and testing laboratories (centers) to another entity or person prohibited. Accredited certification bodies of homogeneous products and test laboratories (centers) operate on certification and testing for certification purposes on the basis of the accreditation certificate issued in accordance with the legislation. Certification bodies are required to provide the applicant at his request the information necessary for product certification. At the request of the applicant certification body shall provide information related to the certification, except for information that constitutes a trade secret. The list of products subject to compulsory certification, approved by the Cabinet of Ministers. Tests shall be carried out by accredited test laboratories (centers) procedures established by the relevant regulations, and in their absence – methods developed by the relevant certification bodies. Payment for mandatory certification made by the applicant in the manner prescribed by law. The amount of funds expended by the applicant of mandatory certification of its products, refers to its cost. Advertise products subject to mandatory certification, but not having the certificate of conformity shall be prohibited. If the certificate has expired or is suspended (canceled). Sales of products improperly labeled mark of conformity shall be prohibited. indicate in the accompanying technical documentation information on certification and regulatory documents that must be met, and provide this information to the consumer (buyer, customer). Procedure for export from the Republic of Uzbekistan of products subject to mandatory certification, established by the Cabinet of Ministers. for state control and supervision over the observance of the rules of certification and certified products. Voluntary certification initiative of legal entities and individuals may be subjected to any product to verify its compliance with regulatory requirements. Disputes relating to the application of this Law shall be considered by the court in accordance with the laws of the Republic of Uzbekistan. Consideration of the appeal shall be made within two weeks. disclosure of information constituting a trade secret of the applicant. Accredited testing laboratory (center) is responsible for providing the certification body of unreliable test results. Certification bodies and testing laboratories (centers) are required to fully compensate the losses caused to the applicant as a result of the actions referred to in this article in accordance with the legislation. Manufacturers (entrepreneurs) for violation of mandatory certification shall be liable in accordance with law. “аккредитация испытательной лаборатории” - официальное признание правомочий испытательной лаборатории (центра) осуществлять испытания конкретной продукции или конкретного вида испытания. Отношения в области сертификации регулируются настоящим Законом и издаваемыми в соответствии с ним иными актами законодательства Республики Узбекистан, а в Республике Каракалпакстан – также законодательством Республики Каракалпакстан. Испытания должны проводится аккредитованными испытательными лабораториями (центрами) методами, установленными соответствующими нормативными документами, а при их отсутствии – методами, разработанными соответствующими органами по сертификации. These rules are developed in accordance with paragraph 6 of the Cabinet of Ministers of the Republic of Uzbekistan dated July 6, 2004 N 318 “On additional measures to simplify the procedure for certification of products” (Collected Legislation of the Republic of Uzbekistan, 2004, N 27, art. 315) and establish common requirements for training and the certification of produced and imported products in the National Certification System of Uzbekistan (hereinafter – Ouse NSS). 1. In accordance with these rules, certification of products, including software and other scientific and technical. 2. Organization and certification is carried out by the certification bodies of homogeneous products, accredited in accordance with established procedure (hereinafter – the OS). 3. Certain certification schemes established in the relevant rules homogeneous product certification and other regulations, which contain requirements for homogeneous products. In this circuit complexity due to the volume of checks depends on the severity of this product. Recommended certification schemes used in the NSS Ouse, are given in Appendix N 1 to this Regulation. Certification scheme in each case selects OS with proposals of the applicant, the scope and duration of delivery, test methods, the characteristics of production and the risk of infringement of its stability, as well as the potential dangers of these products to consumers. Certification in the international systems or agreements executed by the schemes referred to in them. 4. With certification, the confirmation of product compliance with established regulations for certified products (hereinafter – ND) containing a list of characteristics (indicators) to be checked in the certification, inspection and testing methods. In the absence of the LP section on certification tests or use of interstate standard, the OS of the whole complex of the characteristics in the LP or in the international standard, selects first indicators characterizing the safety requirements. 5. When ND certification except for specific products should also be guided by regulations and other officially published ND, set out the mandatory requirements for the product. 6. In order to avoid duplication of testing on the same indicators, accredited test laboratories (hereinafter – AIL) required to implement mutual recognition of test results obtained in other AIL. 7. Payment for the certification made by the applicant in the manner prescribed by law. l) the registration certificates of conformity in the State Register NSS Ouse. 9. The need for sanitary and veterinary examinations, phytosanitary and environmental certification OS determined under appropriate hygienic, veterinary, phytosanitary or environmental requirements stated in the ND products. These procedures can be carried out simultaneously with the certification tests and should be completed with the provision of relevant documents to the applicant prior to the issuance of the certificate of conformity. OS, according to a written statement of business entities may provide agency services for the certification and obtaining all the necessary conclusions in public health surveillance, in the organs of the state veterinary supervision and State Plant Quarantine Service, as well as public bodies for the protection of nature. The burden and responsibility for the accuracy of sampling and their submission to the relevant authorities are operating. 11. For the certification of products within the NSS Ouse applicant sends the appropriate OS application in the form set out in Appendix N 2 to this Regulation. In the absence of information about the applicant certification body of homogeneous products and certification rules he can get her National Certification Body (hereinafter – VAT) or its territorial body. if available, a copy of the health certificate containing the test results in the laboratory authority public health surveillance and information on other requirements set forth in ND (veterinary and phytosanitary Finally, environmental certificate). If the applicant was presented simultaneously apply for a health certificate and a certificate of conformity, a copy of health certificate is submitted after its registration in the prescribed manner. 13. In the absence of the republic ND on imported products subject to mandatory certification, certification tests in terms of quality and safety are carried out in compliance with similar products. In case of failure by the applicant or required regulatory documents on safety specifications for imported products Certification of this product is carried out by the documentation of similar types of products or on the basis of health certificate to conduct its identification (for food products and products in contact with food). Certification of product not having LP and is not subject to the sanitary certification performed by identification. If the applicant has filed an application for both health certificate and the certificate of conformity, a copy of health certificate is submitted after its registration in the prescribed manner. 15. In the absence of the OS, accredited certification of the proposed type of product at the time of filing the application, the application is sent to the NSO or its territorial authority, which shall arrange for certification and determine AIL for certification tests. 16. If there are several types of products OS claimed the applicant is entitled to apply to one of them, at their own discretion. 17. After filing the OS sees it, analyzes and documents submitted not later than two days after receipt of the decision shall inform the applicant that contains all the basic conditions of certification, based on the established order homogeneous product certification, including certification scheme and specify the necessary ND compliance which will be held certification, indicated AIL, which will be conducting the tests. The recommended form of solutions is given in Appendix N 3 to this Regulation. In the presence of ND for certified products sanitary, veterinary, phytosanitary or environmental standards and requirements, the decision also indicated the need for a sanitary, veterinary, phytosanitary, ecological conclusion (certificate). 18. Deadline for certification of products must comply with the terms of control and testing requirements of the LP on the products and / or test methods, consider the time to receive additional documents (hygienic certificate, veterinary conclusion, etc. ), but should not exceed one month. Term certification perishable products (agricultural products and food industry) should not exceed three days, including the day of filing. 19. To verify that all the requirements for certification of ND OS determines in each case, taking into account its existing additional documents (certificate of quality system or the production of test reports competent organizations, sanitary, veterinary, phytosanitary, environmental certificates (conclusion), technical documentation and vendor etc.). In this health certificate when they are transferred to the OS must be accompanied by copies of the test report in public health surveillance. If additional documents contain the results of tests on specific indicators in the AIL, the OS can use these results to assess compliance without additional testing. This takes into account the limitation period test, which should not exceed the expiration date on the product ND. 20. When voluntary certification OS defines the nomenclature characteristics of certified products and methods for their determination, taking into account the proposals of the applicant. If the list of characteristics selected OS test differs from the requirements of ND for the products, it is necessary to specify in the decision on the application. 21. Testing for certification purposes are held in AIL. Unless at the time of certification corresponding AIL, at the request of the certification body, VAT determines the location of the procedure and test conditions that ensure the objectivity of the results. 22. Screening and identification of samples of products for certification, the operating system on-site no later than two days from the filing date. 23. Number of samples, the order of selection, identification and storage rules set in ND for products subject to certification, including test procedures. 24. Number of samples taken for the certification of production batch imported into the country, defines the OS with a view to ensuring the tests according to the test methods ND. It is necessary to comply with limits for selection of imported products for testing by accredited bodies and laboratories established VAT. 25. Identification provided by the product certification with the sampling is done by rules homogeneous product certification. If the results of the identification established that the samples submitted by the applicant does not comply with OD specified in the application, whether or not the samples are representative of the certified products, sampling is not carried out and the applicant submitted a reasoned refusal of certification. 26. Sampling of products is documented in the selection of samples and specimens in two copies, one of which is awarded to the applicant. In accordance with paragraph 2.11 of the Instruction on the order of entry into the territory of the Republic of Uzbekistan and exit from its territory of goods (products) subject to mandatory certification (Reg. N 901 of 26.02.2000), the selection of samples from being stored under customs control imported goods for certification is made with the permission of the customs body of representatives of the certifying authority, in the presence of the owner of the goods or his representative. At the same time the representative of the certification body is drawn on sampling and sample 3 copies of the form prescribed by the agency “Uzstandard”, the second of which a copy is given to the customs authority. 27. The applicant has the discretion to submit the technical specifications of the certified products. The applicant may also submit to the OS, the test conducted in the development and launch of new products, or documents on tests carried out by domestic or foreign testing laboratories accredited or recognized by the accreditation system of the Republic of Uzbekistan. 28. At the request of the applicant or his representative must be given the opportunity to familiarize themselves with the test conditions in the AIL. The applicant has the right to attend the trials of their products. In the AIL must be taken to ensure confidentiality. 29. Responsibility for the quality and reliability of test results of samples, as well as for storage of test reports shall AIL conducting the tests. Test reports shall be signed by an authorized and approved by the head testers AIL. 30. Test reports shall be submitted to the applicant and to the OS. If the product tests for individual parameters were conducted in different AIL, the positive assessment of conformity of production is the presence of all the necessary protocols with positive test results. 31. For negative test results, as well as the presentation of an incomplete set of documents OS gives the applicant concluded the refusal to issue a certificate of conformity with specific standards legislation. 32. Product, completely destroyed during the test, the cancellation shall be drawn in the presence of the applicant (or his representative). Products, unless they are destroyed or partially destroyed in the testing period should be returned to the applicant by hand on paper returns. According to the survey is drawn, which is used to issue a certificate of conformity. 34. Term survey shall not exceed 10 days from the date of sampling. 35. 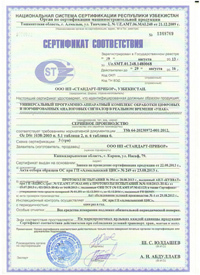 Information about the survey are given in the production of the certificate of conformity for products. 36. OS after considering the report (s) tests, surveys the state of production and documents submitted by the applicant with the application, issue a certificate of conformity or refuses to extradite him. 37. 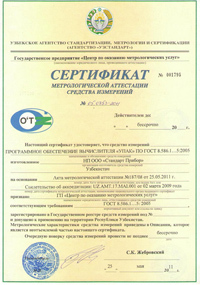 Certificate issued by state or Russian languages. Featuring a certificate of conformity is registered in the State Register NSS Ouse. The certificate is valid only if there is a registration number. Form of certificate of conformity set VAT. 38. 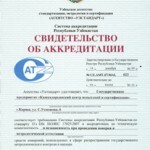 Certificate of Compliance issued to the applicant within two working days, and during the OS production inspection – within five working days of receipt of the OS test results. 39. Certificate of Compliance issued for imported products on the shelf life of products, and for serially manufactured products – for 3 years. 40. 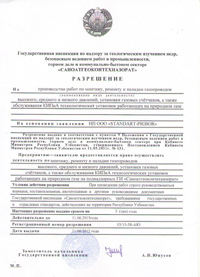 For resolving disputes and for the purposes of surveillance by the agency “Uzstandard” activities OS acts sampling (tests), the certificate of inspection and evaluation of production, copies of test reports shall be retained during the term of the certificate of conformity, but not less than one year. Procedure and terms of copies of the protocols specified in rules homogeneous product certification and documents OS and testing laboratory. At maturity, the storage of these documents, they are shelved or destroyed. 41. On the basis of the certificate of conformity issued, subject to the certification scheme is established by agreement granting the applicant the right to use the certificate of conformity and the use of a mark of conformity. The agreement should specify ways of marking a mark of conformity of certified products and surveillance conditions. 42. Certified serially manufactured products (packaging, containers and accompanying documentation) marked with a mark of conformity under the responsibility of organizing the manufacturer. 43. Implementation of the manufacturer of the certified products may be accompanied by a copy of the certificate of compliance, signed and stamped original holder of the certificate or certifying authority or notary authority. Copies issued to the holder of the original certificate shall be registered in accordance with the shipping documentation for products. Indicated on each copy of its registration number, the number of products sold. 44. Products manufactured in the period of the certificate of conformity shall be deemed certified and re-certification is not subject. Confirmation of product certification is the sign of conformity and date of manufacture in the production and documentation. 45. The applicant is entitled to apply to the OS for the purpose of re-certification of not less than one month before the expiry of the certificate of conformity for the products. Thus operating system can change the certification scheme, taking into account the results of the inspection control. 46. If the planned change in the design (composition) of the products or the technology of its production, which may affect the characteristics of the product, when certified by the certification, the manufacturer shall notify the OS that decides on the need for corrective action. 47. OS issuing the certificate of conformity for serially manufactured products, at least once a year conducts inspection control check of the certified products in order to confirm its compliance with the requirements set forth in the certification. When the inspection control depending on the certification scheme conducted product testing and / or inspection of production. 48. According to the results of the inspection control the certificate of conformity and the use of a mark of conformity can be confirmed, suspended or revoked. 49. Scope, content and procedure for surveillance of certified products is established in the rules of inspection control. 50. OS shall inform the manufacturer and the VAT on the suspension or revocation of the certificate and the applicant the right to use the mark of conformity. VAT determines the need to inform the relevant public authorities and the media about expired certificates. 51. Scheme 1 N applied for certification of a standard sample and test products provides AIL mandatory indicators primarily on safety. This scheme is also used in the absence of a clearly defined product ND. 52. Scheme 2 N applied for certification and provides a standard sample test products in AIL for checking essential indicators. This scheme provides for surveillance products by testing samples taken in the field of trade (the consumer). 53. Scheme 3 N applied for certification of products and provides product testing in AIL for checking essential indicators and inspection of production. This scheme provides for surveillance at the enterprise conducting production tests taken from the manufacturer. 54. Scheme 4 N applied for certification of products and provides product testing in AIL for checking essential indicators and inspection of production. This scheme provides for surveillance products by testing samples taken from both the spheres of trade (the consumer) and of production. 55. Scheme 5 N applied for certification of products and provides product testing in AIL for checking essential indicators, a survey or evaluation of production quality system. This scheme provides supervisory control with conducting product testing and factory inspection (or quality system assessment). 56. Scheme 6 N applied for certification of the quality system and provides for its evaluation and subsequent inspection control. 57. Scheme 7 N applied for certification of party products and provides product testing. 58. Scheme 8 N applied for certification of each individual product. 59. Scheme 9 N applied for certification of products and provides product compliance declaration of its security. 60. Products certified under schemes NN 3, 4, 5, 7, 8, 9 may be marked with the match in the prescribed manner. 61. OS keep records of issued, revoked, suspended their certificates, as well as cases of refusals to grant certificates, in the prescribed manner send information about them and certification activities for VAT. They inform stakeholders about their activities and the certificates they issue. list of registered certification systems of homogeneous products. 63. VAT and OS included in the NSS Ouse, have the right to recognize the certificates of conformity for products coming from the CIS and far abroad, with whom an agreement on recognition. Recognition procedure should be established in the rules of certification of similar products. 64. Recognition of certificates, carried out in the framework of international agreements and systems, carried out in accordance with established systems in these agreements and regulations not inconsistent with the laws of the Republic of Uzbekistan. 65. 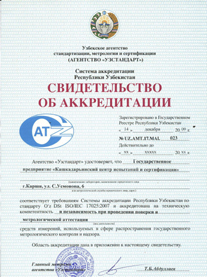 The certificate is accepted for products that comply with the requirements, do not yield the same requirements established in the Republic of Uzbekistan. In the presence of ND additional requirements for mandatory certification or specified in the contract, the product must be subjected to the tests for compliance with these requirements. 66. For recognition of the certificate of conformity applicant submits an application to the appropriate operating system. Recommended application form given in Appendix N 4 to this Regulation. The application shall be accompanied by the original or a copy of the certificate, stamped by the original holder of the certificate or certifying authority, notary or body as well as the documents referred to in paragraph 12 hereof. An applicant may submit an additional copy of the test report for compliance with the additional requirements of ND adopted in Uzbekistan. 67. If there is information on the sanitary certification recognized by the certificate of conformity holding more hygienic certification is not required. 68. Based on the analysis of the documents and materials OS decides on recognition (non-recognition) of the certificate. In the implementation of procedures for the recognition of NSO or OS, if necessary, has the right to verify the identity of the products specified in the application for recognition. 69. Recognition of the certificate of conformity issued by the National Certification System of the exporting country, carried out by reissuing its certificate of conformity established in the NSS Ouse sample and entering into the State Register of NSS Ouse. 70. In case of disagreement with the result of certification interested party may apply to the Board of Appeal of the agency “Uzstandard” or directly to the court. 71. Appeal Board of the agency “Uzstandard” consider appeals against decisions of certification bodies and testing laboratories (centers). Appeals are considered within two weeks in accordance with the procedure established procedures NSS Ouse. 72. The agency’s decision “Uzstandard”, the Appeals Board may be appealed to the court in accordance with legislation. Настоящие Правила разработаны в соответствии с пунктом 6 постановления Кабинета Министров Республики Узбекистан от 6 июля 2004 года N 318 “О дополнительных мерах по упрощению процедуры сертификации продукции” (Собрание законодательства Республики Узбекистан, 2004 г., N 27, ст. 315) и устанавливают общие требования к подготовке и проведению сертификации производимой и ввозимой продукции в Национальной системе сертификации Республики Узбекистан (далее – НСС Уз). Особенности сертификации однородной продукции, подлежащей обязательной сертификации, регламентируются отдельными нормативно-правовыми актами агентства “Узстандарт”. 2. Организация и проведение сертификации осуществляется органами по сертификации однородной продукции, аккредитованными в установленном порядке (далее – ОС). 3. Определенные схемы сертификации устанавливаются в соответствующих правилах сертификации однородной продукции и других нормативных актах, содержащих требования к однородной продукции. При этом сложность схемы, обусловленная объемом проверок, зависит от степени опасности этой продукции. Рекомендуемые схемы сертификации, применяемые в НСС Уз, приведены в приложении N 1 к настоящим Правилам. 4. При сертификации осуществляется подтверждение соответствия продукции требованиям, установленным нормативными документами на сертифицируемую продукцию (далее – НД), содержащими перечень характеристик (показателей), подлежащих проверке при сертификации, методы контроля и испытаний. 6. В целях исключения дублирования проведения испытаний по одним и тем же показателям, аккредитованные испытательные лаборатории (далее – АИЛ) обязаны осуществлять взаимопризнание результатов испытаний, проведенных в других АИЛ. свидетельство об аккредитации, выданное агентством “Узстандарт”. 11. Для проведения сертификации продукции в рамках НСС Уз заявитель направляет в соответствующий ОС заявку по форме, приведенной в приложении N 2 к настоящим Правилам. При отсутствии у заявителя информации об органе по сертификации однородной продукции и правил сертификации он может получить ее в Национальном органе по сертификации (далее – НСО) или его территориальном органе. 17. После подачи заявки ОС рассматривает ее, проводит анализ представленных документов и не позднее двух дней после ее получения сообщает заявителю решение, которое содержит все основные условия сертификации, основывающиеся на установленном порядке сертификации однородной продукции, в том числе указывается схема сертификации и необходимые НД, на соответствие которым будет проведена сертификация, указывается АИЛ, которая будет проводить испытания. Рекомендуемая форма решения приведена в приложении N 3 к настоящим Правилам. В соответствии с пунктом 2.11 Инструкции о порядке ввоза на территорию Республики Узбекистан и вывоза с ее территории товаров (продукции), подлежащих обязательной сертификации (рег. N 901 от 26.02.2000 г. ), отбор проб и образцов от находящихся на хранении под таможенным контролем импортных товаров для проведения сертификации производится с разрешения таможенного органа представителями органа сертификации, в присутствии владельца товара либо его представителя. При этом представителем органа сертификации составляется акт об отборе проб и образцов в 3 экземплярах по форме, установленной агентством “Узстандарт”, из которых второй экземпляр вручается таможенному органу. 33. Обследования состояния производства сертифицируемой продукции устанавливаются правилами сертификации однородной продукции, которые разрабатываются ОС и утверждаются агентством “Узстандарт”. 37. Сертификат оформляется на государственном (узбекском) или русском языках. Оформленный сертификат соответствия регистрируется в Государственном реестре НСС Уз. Сертификат действителен только при наличии регистрационного номера. Форма сертификата соответствия устанавливается НСО. 38. Сертификат соответствия выдается заявителю в течение двух рабочих дней, а при проведении ОС обследования производства – в течение пяти рабочих дней с момента получения ОС результатов испытаний. 39. Сертификат соответствия выдается на ввозимую продукцию на срок годности продукции, а для серийно производимой продукции – на 3 года. 40. Для решения спорных вопросов и для целей инспекционного контроля со стороны агентства “Узстандарт” деятельности ОС акты отбора образцов (проб), акт обследования и оценки производства, копии протоколов испытаний подлежат хранению в течение срока действия сертификата соответствия, но не менее года. Порядок и сроки хранения копий протоколов устанавливаются в правилах сертификации однородной продукции и в документах ОС и испытательной лаборатории. По истечении установленного срока хранения указанных документов они сдаются в архив или уничтожаются. 42. Сертифицированная серийно производимая продукция (упаковка, тара и сопроводительная документация) маркируется знаком соответствия под ответственность организации-изготовителя (для Узбекистана на государственном языке). 51. Схема N 1 применяется при сертификации типового образца и предусматривает испытание продукции в АИЛ по обязательным показателям в первую очередь по безопасности. Данная схема также применяется при отсутствии четко определенного НД на продукцию. 52. Схема N 2 применяется при сертификации типового образца и предусматривает испытание продукции в АИЛ для проверки обязательных показателей. Данной схемой предусматривается проведение инспекционного контроля продукции путем проведения испытаний образцов, взятых в сфере торговли (у потребителя). 53. Схема N 3 применяется при сертификации производимой продукции и предусматривает испытание продукции в АИЛ для проверки обязательных показателей и обследование производства. Данной схемой предусматривается проведение инспекционного контроля на предприятии с проведением испытаний продукции, взятой у изготовителя. 54. Схема N 4 применяется при сертификации производимой продукции и предусматривает испытание продукции в АИЛ для проверки обязательных показателей и обследование производства. 55. Схема N 5 применяется при сертификации производимой продукции и предусматривает испытание продукции в АИЛ для проверки обязательных показателей, обследование производства или оценку системы качества. Данной схемой предусматривается инспекционный контроль с проведением испытаний продукции и обследования производства (или оценки системы качества). 56. Схема N 6 применяется при сертификации системы качества и предусматривает ее оценку и последующее проведение инспекционного контроля. 57. Схема N 7 применяется при сертификации партии продукции и предусматривает испытание продукции. 58. Схема N 8 применяется при сертификации каждого единичного изделия. 59. Схема N 9 применяется при сертификации продукции и предусматривает декларирование соответствия продукции требованиям ее безопасности. 60. Продукция, сертифицированная по схемам NN 3, 4, 5, 7, 8, 9 может быть маркирована знаком соответствия в установленном порядке. 66. Для признания сертификата соответствия заявитель направляет заявку в соответствующий ОС. Рекомендуемая форма заявки приведена в приложении N 4 к настоящим Правилам. 70. В случае несогласия с результатом сертификации заинтересованная сторона вправе обратиться в Апелляционный совет агентства “Узстандарт” либо непосредственно в суд. 71. Апелляционный совет агентства “Узстандарт” рассматривает жалобы на решения органов по сертификации и испытательных лабораторий (центров). Апелляции рассматриваются в течение двух недель в соответствии с порядком, установленным процедурами НСС Уз. 72. Решение агентства “Узстандарт”, Апелляционного совета может быть обжаловано в суд в установленном законодательством порядке.